Login using the details supplied in the Voice Configuration Email we sent you. Once logged in, click the User Portal button at the top of the page. You will now see the different settings and features available to toggle - presented in different modules on the page. Call forwarding is a service that redirects (forwards) all incoming calls to another desired number of your choosing. In the My Settings section, tick Enable Call Forward. In the Forward Calls To field that appears, enter your desired number to forward all calls to. If this setting is enabled, then calls to the forwarded number will also continue to call your phone simultaneously. This feature could be used if you’re sporadically away from your phone - to ensure calls are never missed. If this setting is enabled, then calls forwarded to the redirect number will retain the incoming caller ID. This is useful so you can see who is calling even when your number is forwarded. If this feature is disabled, all forwarded calls will appear as your account's caller ID. Filter records based on a range of days. View up to 100 records at once (10 is shown by default). Sort currently viewed information by Date, Caller ID or Call Duration. Search field to isolate particular calls, by number. Listen to, download or delete messages. View up to 100 messages at once (10 is shown by default). Sort messages by Date, Caller ID, or Status. Mark message status as New or Saved. Search field for locating particular messages, by number. Note: This option is located in My Settings section, next to Call Forwarding. You can change the email address that voicemail notifications are sent to, or disable this feature, under the My Settings section. Note: By default, voicemail notifications received to your email address are not deleted from your voicemail box, when the email is trashed. They will continue to exist in your voicemail box, until deleted via the Web User Portal or by calling *97 via your phone (discussed under Feature Codes). You should check your voicemail box periodically, to prevent it becoming full. Feature Codes are shortcuts to toggle settings and access services. They are triggered by dialing the * key, followed by a specific number on your phone. The first time you access Voicemail from your phone, you'll be guided through the setup of your Greeting and Password. Note: Both your mailbox number and default password are included in the Voice Configuration Email we sent you. Congratulations - your mailbox is now setup and ready for use. 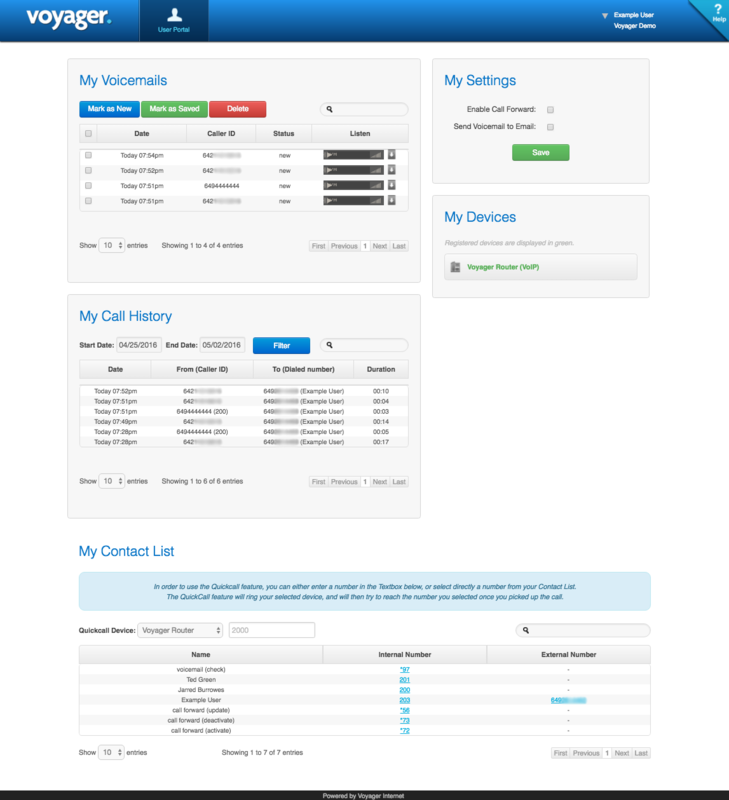 Post the initial Voicemail setup, you have the option to make changes to settings when required. This feature code enables the use of Call Forwarding. The number you entered will now be read back to you. This feature code disables any active Call Forwarding. This feature code will either enable or disable Call Forwarding, depending on its current state. If enabling - it also remembers the last number you forwarded to and enables it without asking for a new number. Forwarding will be disabled - and a prompt will be played to confirm. Forwarding will be enabled and will forward to the last number you forwarded to - and a prompt will be played to confirm that number. Note: If Call Forwarding has never been enabled, you’ll be prompted to enter a number. This feature code updates the call forwarding number. It also updates the currently stored number, for use with the Toggle Call-Forward feature. The new number you entered will now be read back to you. Note: The status of call forwarding will not be changed by this code, so if it is disabled or enabled - it will remain so. This feature code enables you to hide your outgoing Caller ID when making a call. Note: The privacy feature code works on a per call basis. You must prefix *67 before the desired number - each time you wish to anonymize your Caller ID.